How can I stop my dog jumping up? This is one of the first questions I’m asked by new dog-owners. Whether they have a brand-new puppy or an older rescue dog, this is the universal cry! But as you’ve seen in New Puppy? New Rescue Dog? Start here! you’ll do better if you look at it from another angle. Instead of trying to stop your dog doing something, rather teach him what you’d like him to do instead. If he has something he can do and knows it will please you, he won’t need to do all the things you find annoying when he would like your attention. Or when he wants to greet you. It's natural for a puppy to try to reach your face with a "kiss" - that's how they greet their dam in the nest. When she returns after a hunt, the puppies will all reach up and lick her face and teeth, to prompt her to regurgitate her kill. 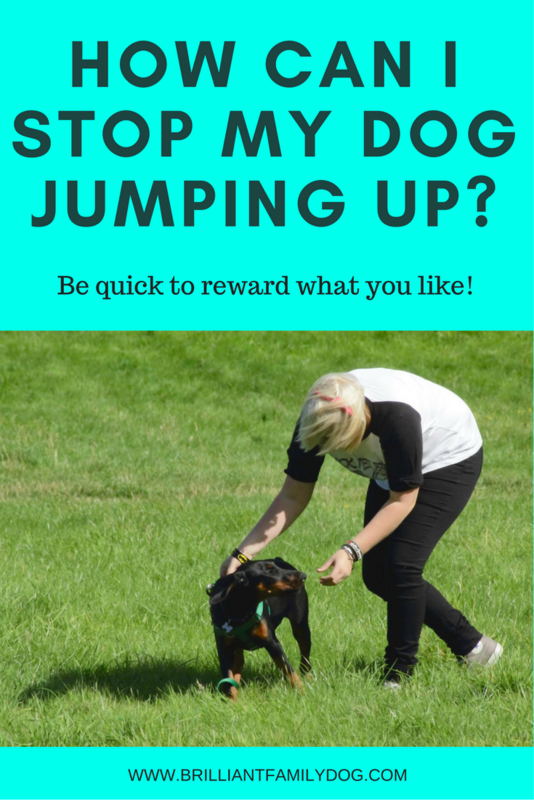 So one way to prevent your puppy jumping up is to get down to his level first! Another regular winner is to focus him on keeping his feet on the floor. If you have a solidly-trained Sit (be honest! That means you say the word Sit just once, and your dog throws his tail-end to the floor as fast as he can) you can ask him to do that before you ever give him any attention. You have to get your word “Sit” in before he jumps, otherwise you’re teaching a neat behaviour sequence of Jump - Sit - Reward. He’ll think he has to jump before he can sit! Not the outcome you want at all. In fact, you can just stand and wait for him to work out that jumping is not doing the trick and he'll either stand or sit without you having to say a word! Be sure you don't reward his jumping with cries of "Off! Get down! Ouch!" which he will take to mean "I love this! Keep jumping!" If your Sit is still a bit wobbly, or you have a young pup who doesn’t know it yet, simply placing a treat on the floor between his feet will get him to look floorwards. He can’t be staring at the floor at the same time as jumping up, so the problem is eliminated. Similarly, he can’t be sitting at the same time as jumping up. Either way will work to keep your pup’s feet on the floor and off you - without having to admonish or scold him for his enthusiasm. These methods will work perfectly to focus your dog’s attention on the floor when he’d like to put his paws on you. But you can’t expect your visitors to do this training for you! They need to be protected from flying paws and playfully snapping jaws. And the quickest and simplest way is to have your dog on a lead before you admit a visitor to your home, and stand on that lead so that it’s loose enough for your dog to sit, stand, or lie down, but not loose enough for him to jump up. If he’s keeping (more or less) still, he gets the opportunity to say hello to your guest - as long as his feet stay on the floor. Now he’s learning how to greet visitors politely. The quickest way to solve many puppy behaviour problems is simply to ensure that what you don't like cannot happen. Much more fun to direct your puppy to something you do like, rather than continually nagging him and focussing on what you don’t like. Once you find this system working for jumping up, you can start to apply it to anything else you’d like to see changed in your pup. You’ll find lots more helpful hints like these in our free e-course which you will find here.